Fellow collectors and those who are just interested in the hobby of Law Enforcement and Security Industry badges and memorabilia collecting. Welcome to Glenn's Badge Collection website. This site is dedicated to my hobby of collecting law enforcement and security badges and memorabilia. My collection includes primarily state, city, and tribal police department badges, patches, and other memorabilia from Alaska and Washington states. My career began in the state of Alaska where I was born and raised. My interest in law enforcement began when I was a "charter member" of the Alaska Student State Troopers in Fairbanks, I then went on to the Fairbanks and Cordova Police Departments before moving to the Seattle Washington area, where I had been employed in security management within the healthcare industry. 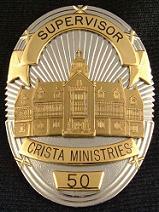 Presently I oversee security operations at CRISTA Ministries in Shoreline, Washington who's business functions include senior residential, healthcare, school, (pre-school through high school), and commercial radio broadcasting. I welcome everyone to this site and invite you to view my photo albums that contain individual photos of a portion of my badge collection for your viewing pleasure. Additional pages includes photos of some of my various collection displays. I hope that you enjoy the site and I encourage you to come back frequently as I add other items from my collection. Any feedback regarding this site is greatly appreciated. 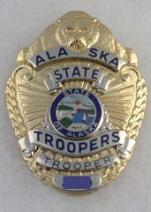 Alaska State Trooper related website of collector Kevin Corr.